How do I use the Courses page? The Courses page contains all your courses in Bridge. You can sort and filter your courses and view details for each course. Times and dates within Bridge reflect the time zone of your browser. On the Courses page , you can view the name and author of each course. If learners are enrolled in the course, you can view the next course due date . Courses that have been shared from a top-level account or sub account will list the originating account . Courses that have not been published include a draft status . You can identify SCORM or uploaded courses with the upload icon . You can view Active or Archived courses . In the Search field , you can search for course names and tags in the account. In the Sort menu , you can sort courses by date created (newest), date modified (updated), or alphabetically by title. 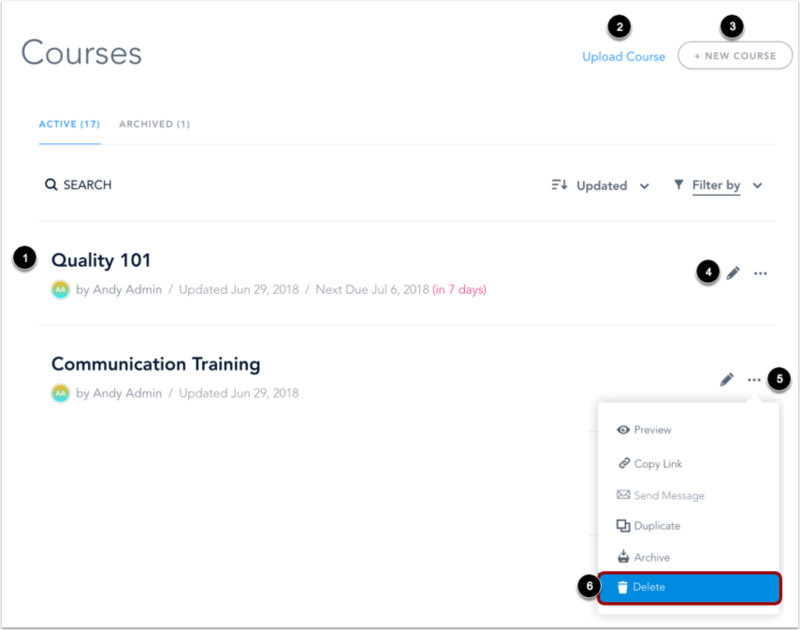 In the Filter menu , you can filter the course list by courses created by you, unpublished courses, courses without learner enrollments, and courses that include a certificate. You can also filter by content type. 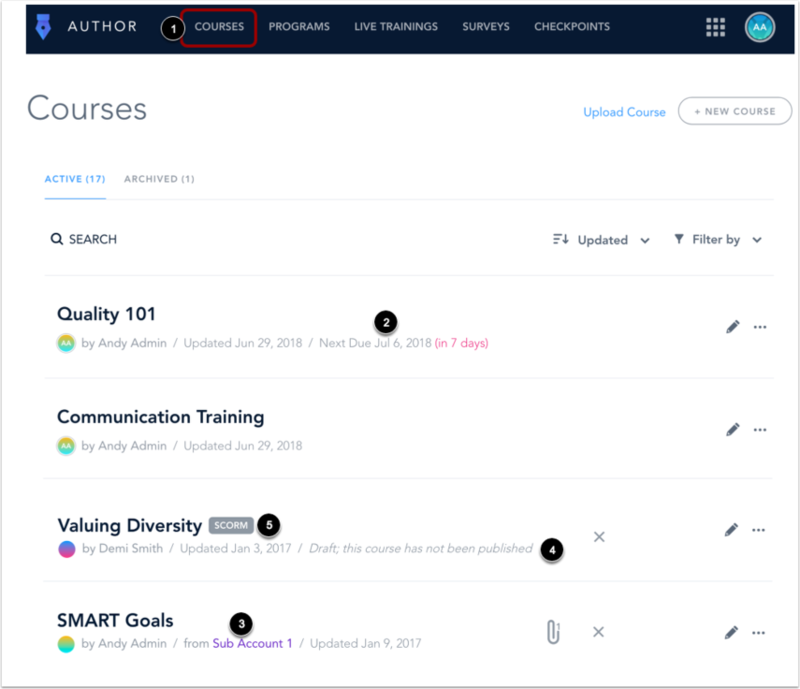 The different options for content type include native Bridge courses, SCORM courses, LinkedIn Learning courses, and courses added from the OpenSesame marketplace. If your account is utilizing sub accounts, you will also be able to filter by the account in which the course was originated by using the Accounts menu. To view details for a course, click the name of the course . To upload a course as a SCORM package, click the Upload Course link . To manually add a course, click the Add New Course button . To edit a course, click the Edit icon . To delete a course, click the More Actions icon  and then click the Delete link . You cannot edit course content for an uploaded SCORM course. Authors can delete a course if it does not contain any required or optional learner enrollments. Admins can delete any course from the account. Courses part of a program cannot be deleted. Previous Topic:How do I sign out of Bridge? Next Topic:How do I view course details? Table of Contents > Manage Courses > How do I use the Courses page?